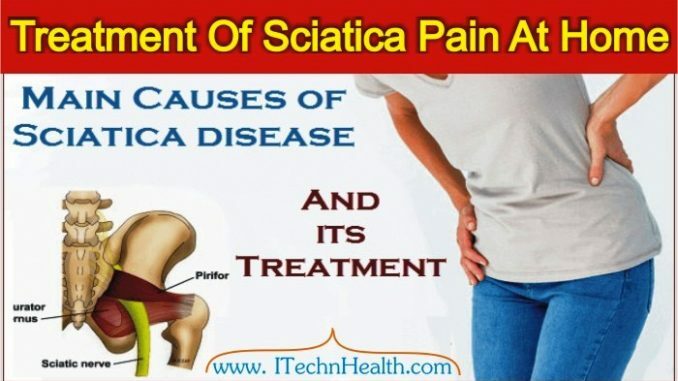 Sciatica disease is also called the scientific name “Sciatic Nerve Disease.” It is the longest nerve in your body. The sciatic nerve runs along the thigh and passes down to the thigh, foot and fingers too. Some people believe that this disease affects only women, but this belief wrong, it affects women and men alike, and increases the chance of exposure to disease between the ages of 50-30 years. The patient suffers from the disease sciatica pain in the buttocks. Pain extends from the waist to the feet, and feel in his feet, chills, cramps in the muscles sometimes. Slipped disc Is the most common reason causing sciatic nerve pain, herniated disc in one of the lumbar spine pressing on a nerve and cause severe pain increases with time and with the stress and fatigue rapid aging of the spine, where the spine less flexibility. The joints are not functioning fully, right by the deformation of the spine and there are less common reasons we would remain contained because they be the cause of sciatica such as infection, inflammation and tumor growth in the spine. 1- A lot of simple cases “short-term pain” can be treated without the need to go to the doctor and taking medication doses. Which can get rid of the pain by taking some painkillers, do some simple exercises, such as to stand on a chair, leaning back on one leg and leave the man you feel pain, suspended in the air and start moving it back and forth, this helps to relieve the pain. 2- Drinking ginger, it reduces neuropathic pain so it is a good treatment for the pain of sciatica, and a lot of drinking water, and sleep on a wooden bed. In very rare cases we resort to surgical resolve to get rid of the pain once and for all. In cases of chronic pain it is worth reviewing specialist Physiotherapy and regularity under the supervision of a doctor.